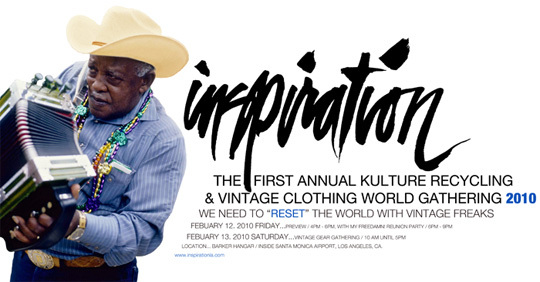 The kulture recycling & vintage fashion event “Inspiration” will be hosted by Rin Tanaka, the author of the “My Freedamn!” book series. Under the big theme of his life, “vintage fashion,” this event will be held at one of the coolest “event halls” in Los Angeles, “Barker Hanger,” which is located inside Santa Monica Airport. As the photo on this page shows, this vintage-looking space is mostly used as vintage airplane storage for repair crews, but on February 12th and 13th, 2010, this huge indoor space (capacity: 3,000 people) will be filled with many vintage fashion fans from around the world! During this two-day show, a total of 60 vendors and exhibitors will set up unique and very special booths displaying their own inspiration: 35 vintage fashion dealers, 10 designer & artist booths, 8 charity garage sales, and 7 special exhibitions. Their business concept in this vintage atmosphere is to “buy and sell inspiration.” Actually, many “kulture recycling” products, mainly vintage American fashions manufactured in the 1910s-1980s, will be displayed everywhere in this hall. Vintage fans will get amazing opportunities to view so many vintage items. Most items will be “for sale,” except for special exhibition decorations.